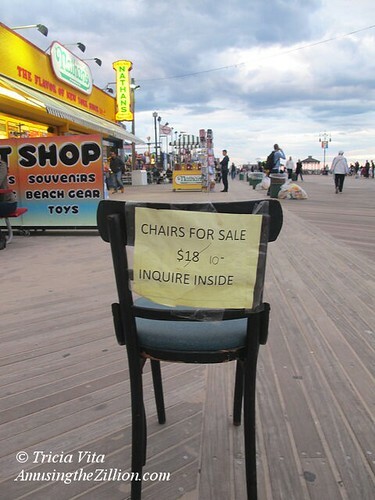 Whether you’re a regular at Ruby’s Bar & Grill or a fan who drops by on Mermaid Day, here’s your chance to own an original chair from the legendary watering hole on the Coney Island Boardwalk. Ruby’s co-owner Michael Sarrel told ATZ the chairs are up for sale because they are getting new seating. The price is right — only ten bucks–marked down from $18. On a snowy day at home, you can tip back on your souvenir chair and imagine you’re back at Ruby’s in Coney Island and it’s summer. Back in the early 1900s, the Shell View Syndicate sold seashells by Brooklyn’s fabled seashore. These scallop shells with accordion folded booklets of miniature photos tucked inside are one of the most charming souvenirs of Coney Island that we’ve come across. Tied together with red ribbon and measuring just 1-5/8 x 1 x 7/8, the seashells are in the collection of the New-York Historical Society. If you take a look at the photographs on the Society’s Collections page, you’ll see Steeplechase Park’s Ferris Wheel and Airship Ride, Luna Park’s Promenade, Circle Swing, and Elephant Ride, Stauch’s Restaurant and Dance Hall, and a Beach Scene. A web search of “The Shell View Syndicate” turned up a few tidbits about the company. They had offices at 147 West 23rd Street in Manhattan in 1908. Their line of souvenirs included “New York in A Seashell, “Allentown in a Nutshell” and novelty postcards, but “Coney Island in a Seashell” is destined to remain our favorite. When Henry M. Henderson died in Los Angeles in 1909, his obituary said “Mr. Henderson bought property in Coney Island thirty years ago and started one of the first amusement places. He acquired a large fortune and the family now owns all of the property between Henderson’s Walk and Stratton Walk, extending from Surf Avenue to the sea.” Henderson’s establishment began as a restaurant at Bowery and Henderson Walk in 1881. His son Frederick managed the family’s Coney Island empire, which included a music hall featuring vaudeville acts and a bathing pavilion at the foot of Sea Beach Walk. Sadly, the last remnant of Coney pioneer Henry Henderson’s empire isn’t being rehabbed and re-used. The building is currently being demolished by Thor Equities. On Friday there was one wall left standing. Henderson’s will be gone in a couple of days. A few weeks ago we posted Charles Denson’s video tribute to the Henderson Theater. In lieu of an obituary, we decided to write about the survival of this humble but treasured memento. For more info on the history of the building, see “Photo of the Day: Interior of Coney Island’s Doomed Henderson Music Hall” (ATZ, April 29, 2010). RIP Henderson Music Hall. Just got word the last wall of this historic Coney Island building was demolished this afternoon. Bad things have happened in threes in Thor’s Coney Island over the past few months: The demolition of the Bank of Coney Island, the Shore Hotel, and finally the Henderson Music Hall. Now when tourists exit Stillwell Terminal, their first sight of Coney Island will be one of Thor Equities infamous empty lots!